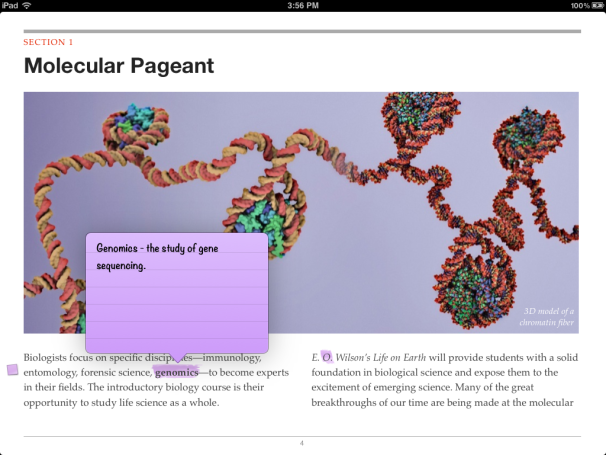 Thursday’s iBooks 2 update delivered interactive textbooks to the iPad. These books incorporate video clips, moving diagrams, audio commentary, and other new features that exploit the iPad’s touch interface. With a handful of such books already available for purchase from the new Textbooks section in the iBookstore, I decided to take the updated iBooks out for a test drive. What I found were books that feature stunning images and impressive graphics that make traditional printed textbooks feel out-of-date. 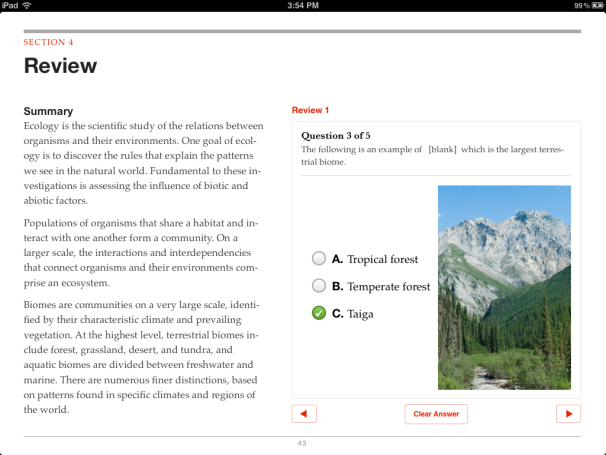 iBooks textbooks are geared for the K-12 grade levels at this point; as of Thursday, the books available in the iBookstore are specifically aimed at high schoolers. Apple says it’s working closely with major textbook publishers Pearson, McGraw Hill, and Houghton Mifflin Harcourt to bring widely used textbooks to life through this new format. Those three publishers account for about 90 percent of textbooks sold in the U.S., according to Apple senior vice president of worldwide product marketing Phil Schiller. These textbooks are ready for purchase in the iBookstore. Pearson has two titles available for purchase (covering biology and environmental science, respectively), while McGraw Hill has five—for physics, chemistry, algebra, geometry, and biology. For elementary-school aged kids, DK Publishing has three textbooks available. These companies already have more textbooks in the works. Also available is an introduction to E.O. Wilson’s Life on Earth, a textbook from the acclaimed biologist. While the previewed chapters are stunning, only one complete chapter is currently available—the publisher says more chapters will come out periodically through the iBookstore over the next two years. (It’s worth noting that this kind of chapter-by-chapter approach could appeal to educators who’d prefer to pick the most relevant chapters of a text rather than buying the entire book.) The remaining content in this demo book shows how to use this book, and what the benefits are to this style of studying. Though the current interactive textbook marketplace is scarce, Apple’s new partnerships with major K-12 textbook publishers indicate that the iBookstore library will be filling up quickly. The first thing to notice when opening a digital textbook in iBooks for the first time is the interactive table of contents. Each chapter has its own full-screen title page that lists the sections of that particular chapter. You’ll see thumbnails of each page of the chapter along the bottom or side of the display. To get to a listed section, just tap on the section subhead. You can also scroll through the page thumbnails to find whatever page you want. Swiping across the middle of the contents page—in other words, not where the page thumbnails are—takes you to a different chapter. At any time on any page, you can pinch to bring back the thumbnail page icons and chapter navigation page. 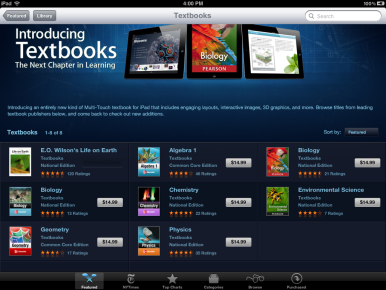 Textbooks in iBooks feature an interactive table of contents. Some books also have an introductory video. When I opened Life on Earth, a video featuring E.O. Wilson immediately began to play. It felt like a movie trailer, a preview of what was to be found inside this book. It was exciting. Once you’ve found the page you’re looking for, navigation is easy and intuitive. Swipe from right to left to go to the next page; swipe from left to right to go back. If you need to get to a specific page, hit the search shortcut—a magnifying glass icon in the top right corner. You can also use search to find keywords or terms. The top toolbar includes shortcuts for accessing notes, the main library, the chapter’s glossary and table of contents, and bookmarks. You can also adjust the display’s brightness. Pinch-closing the page takes you back to the chapter’s table of contents. As I mentioned above, each chapter has its own glossary or vocabulary words, just as traditional textbooks do. Since these terms are bolded, they’re easy to spot. Tap on the word once, and the glossary definition pops up. From there, you have the option to view a dictionary definition of the word, or take a look at the complete glossary of terms for the book. Highlight text and take notes as you study. Video content adds another dimension of learning, and it’s easily the most eye-catching part of these new textbooks. Clips appear as still images on a page until you tap the play button. To make a video full-screen, use the standard iOS pinch-and-pull gesture: Tap the video box with two fingers and pull outward to expand. You pinch to exit full-screen mode or tap the x in the upper left-hand corner to get back to reading. 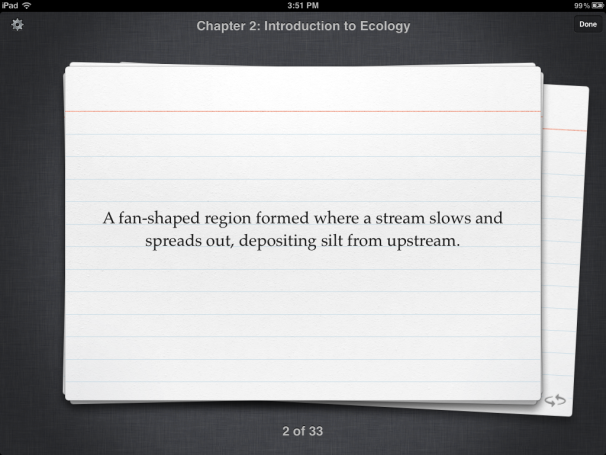 iBooks textbooks also use interactive models and diagrams. You can zoom closer, make a model rotate, and use interactive buttons to learn more about what you’re seeing. For example, Life on Earth has an excellent interactive DNA model that rotates 360-degrees. For problem sets in the Algebra 1 textbook I looked at, these video diagrams show step-by-step problem solving for sample equations—they proved especially handy during graph-based problems. Tap on the iPad's display to reveal the next step of this math problem. Still images can be expanded to full-screen by using multi-touch gestures. Images often come in photosets and can be viewed as a full-screen slideshow. 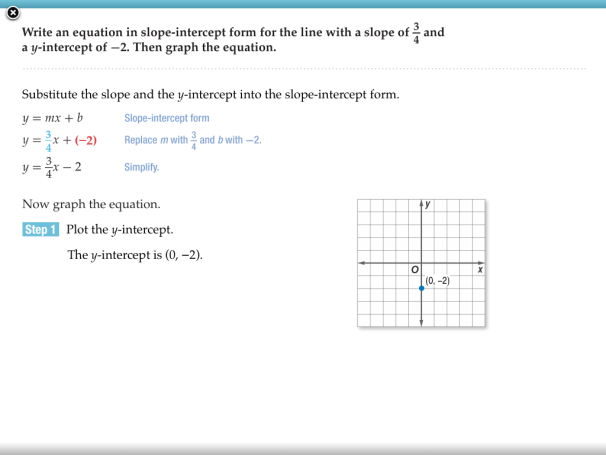 Apart from just displaying content, these interactive textbooks have built-in tools to help students review what they’ve learned. A sure-to-be popular feature of iBooks 2 is Study Cards—a set of digital index cards to quiz students on glossary terms and important chapter information. Glossary terms are found on one side; flipping it over reveals the definition. Notes taken throughout the chapter are automatically turned into Study Cards, with highlighted text on one side and your customized notes on the other. When reviewing flashcards, you can shuffle them, choose to only study the glossary terms, or choose to only study your own notes. Study Cards give you a chance to review your notes. Chapters in textbooks can end with multiple choice study questions and a review summary. Slackers beware—the answers to these questions aren’t directly found in the summary itself, so you actually have to read the material thoroughly and take good notes to know the answers. This chapter on ecology ends with a summary and short quiz. 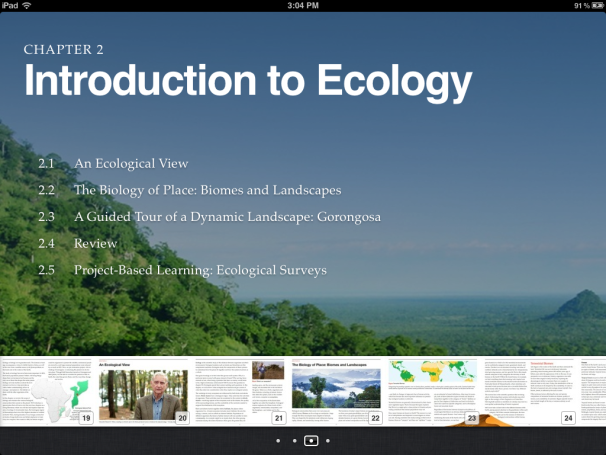 The iBooks 2 app upgrade is free; Textbooks cost $15 and less.